Hint: BPM value for song can differ from BPM of patterns that song contains. 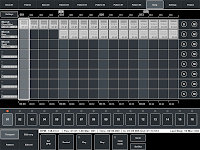 When you add first pattern to empty song BPM will set to the pattern BPM value. All next added patterns will not changing this value. [Rewind] - Returns playback pointer to beginning of song. 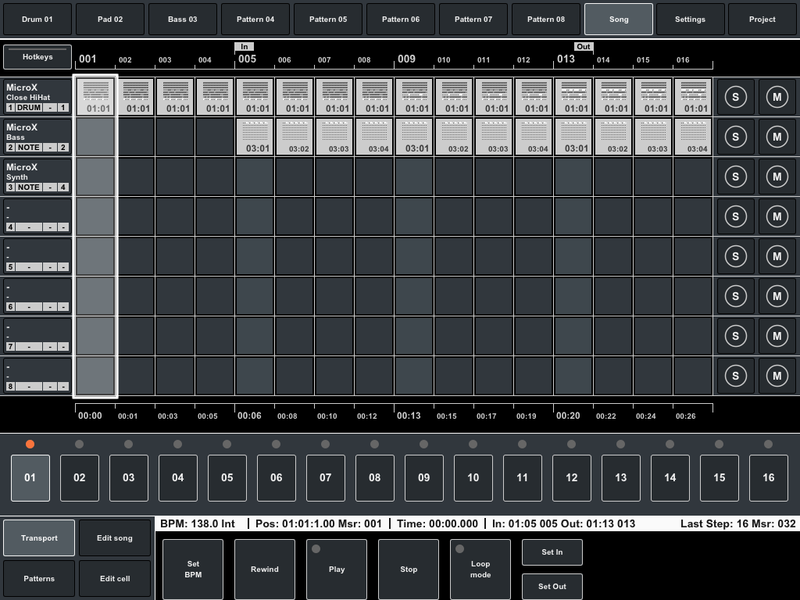 Also you can use it during playback. When the "Loop mode" is enabled the "Rewind" button will returns playback pointer to "In" marker position if pointer located after it, or to beginnnig of song if before. Next clicks will toggle the pointer between beginning of song and "In" marker. [Play] - Playback of current song. Indicator on "Play" button shows that current song is playing. When the "Loop mode" is enabled the "Play" button will starts playback from "In" marker position if pointer located after it. If playback pointer located before "In" marker playback will starts from beginning of song (by default) or from current location of pointer. After reaching the "Out" marker playback will continue from "In" marker. [Loop mode] - This mode allows play song in loop between "In" and "Out" markers. Indicator on this button shows that current mode is active. [Set In] - Set "In" marker in current location of pointer. [Set Out] - Set "Out" marker in current location of pointer. Hint: During playing you can use Mute ("M") and Solo ("S") buttons at the end of each track to switching off playback one or several song tracks - Mute mode, or play only one song track - Solo mode. 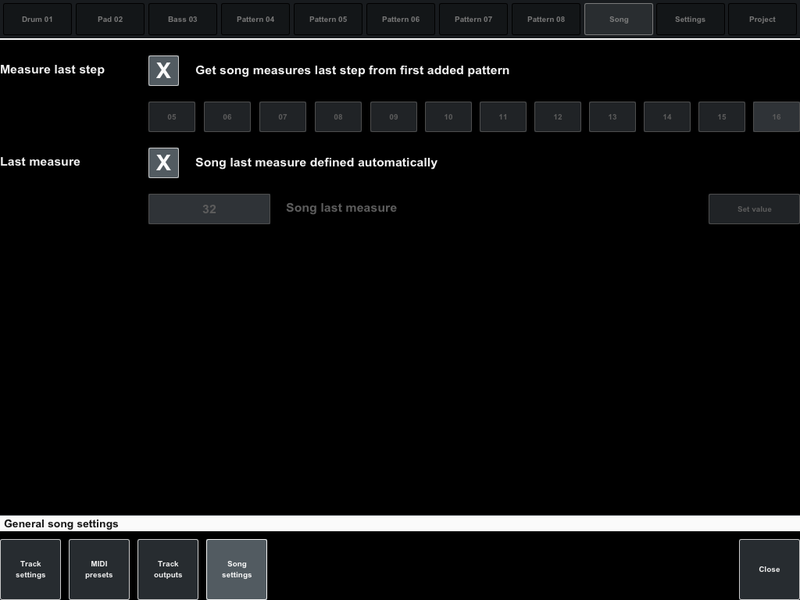 "Measure last step" parameter defines last step (last cell) for each measure of song. If this checkbox is set the "Last step" value will be taken from the first pattern added to empty song. All next added patterns will not changing this value and will be used current value. You can define "Last step" for entire song manually by switching off checkbox. "Last measure" option defines total measure for playback. Playback of song will be stopped after last measure. By default this value will be calculated automatically in depending of last used measure cell in the song. You can set this value manually by switching off checkbox. Please note: Song playback pointer and "In"/"Out" markers can't be placed after last measure.